Today we're making a teacup apron with Janet. 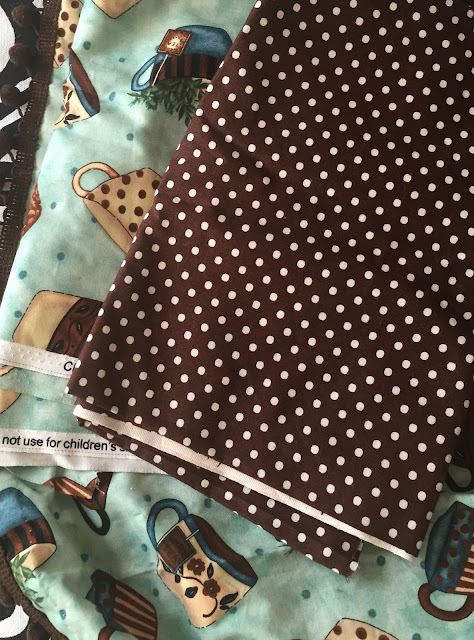 We found this tea cup fabric and JoAnns and fell in love, but of course, you can use any fabric you love. Measure your waist. Open up your apron string, contrasting fabric. Cut a strip 5 inches wide for your apron string, allowing 15 extra inches at each end (30 total), so you can tie it. You may choose to use the other fabric to extend the tie. Set aside. Hem sides and bottom of fabric with a 5/8 inch seam, so no raw edges are exposed. 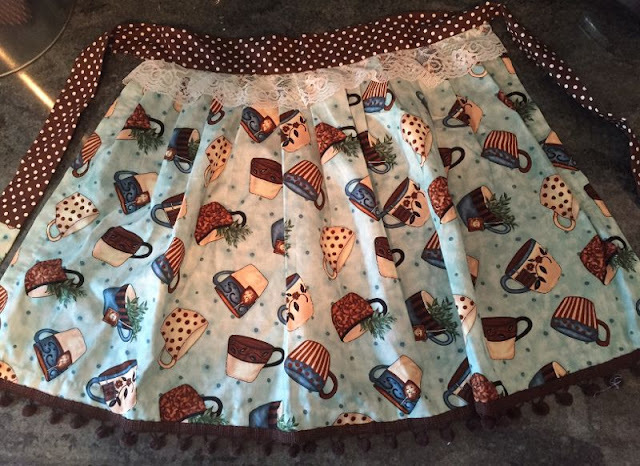 Pin your apron string fabric together inside out. Sew one seam and turn right side out. Gather the raw edge of the top of the apron into pleats and pin it to the apron string. If you are using a lace embellishment, slide the edge of the lace in-between the apron strong fabric and the skirt on the right side and place a few more pins. Make sure pleats are uniform and have the look you desire. It's easier to sew this all together. Now your apron is together. Step Five: You can add an optional row of pom poms or another embellishment.